The Taiwanese company has unveiled its new device. After numerous leaks, the HTC One M8 has been officially announced. It follows the line of its predecessor, but it includes the latest advances in technology and improves some aspects of HTC One. Although the overall appearance does not differ substantially from the previous model, there are plenty of improvements that make it one of the best devices on the market. Display. In almost the same size, HTC has managed to extend the display up to 5 inch, keeping the HD resolution of 1080×1920 pixels. Processor. Like other high-end smartphones that have been presented these weeks, the HTC One M8 carries a 801 Snapdragon working at 2.3 GHz. Memory. It has kept the 2 GB of RAM and it is offered in two models with different internal storage, 16 GB or 32 GB. An important novelty is that now it includes support for micro SD card extending the capacity up to 128 GB. Battery. The battery has increased slightly to 2600 mAh, which doesn’t seem much, but the company says that the M8 is able to last 40% longer than the previous model. It also has a fast charge mode and an extreme power saving mode that keeps the phone running with minimum functions for 2 weeks. Camera. It has a double rear UltraPixel camera, named DuoCamera. This extra camera its focused mainly in the post processing of the images, improving the performance of the individual camera. Software. It is powered by Android 4.4.2 KitKat customized with Sense 6.0, which maintains the BlinkFeed system and incorporates FitBit and Foursquare, among others. 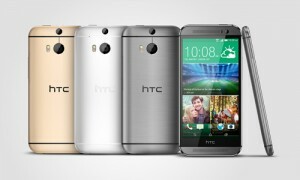 The HTC One will be available from mid-April, and it will be offered in four colors. A Play Edition version is already available on the Play Store. You can make a preorder now and the device will be available in the coming weeks. The price is $649 unlocked.